Laziji (simplified Chinese: 辣子鸡; traditional Chinese: 辣子雞; pinyin: làzǐjī), is a Sichuan Chinese dish. 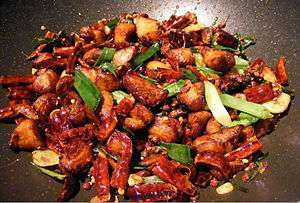 It consists of marinated, deep-fried pieces of chicken stir-fried with Sichuan chilli bean paste (doubanjiang), Sichuan peppers, garlic, and ginger. Toasted sesame seeds and sliced spring onions are often used to garnish the dish. Diners use chopsticks to pick out the pieces of chicken, leaving the chilies in the bowl. Laziji originated near Geleshan in Chongqing, where restaurateurs used small free-range chickens from nearby farms. This poultry became a signature export for Geleshan. ↑ Dunlop, Fuchsia. "Firecracker chicken – laziji 辣子鸡". Fuchsia Dunlop. Retrieved 26 October 2016. ↑ Dunlop, Fuchsia. "Recipe: Firecracker poussin with chillies". Financial Times. Retrieved 26 October 2016. ↑ Wright, Clifford A. (2005). Some Like It Hot: Spicy Favorites From The World's Hot Zones. Harvard Common Press. p. 480. ↑ Knyazeva, Katya (January 26, 2010). "The search for the best la zi ji in Shanghai". CNN. Retrieved August 12, 2012.